Finding Dory is a 2016 American 3D computer-animated comedy-drama adventure film produced by Pixar Animation Studios and released by Walt Disney Pictures. Directed and co-written by Andrew Stanton with co-direction by Angus MacLane, the screenplay was written by Victoria Strouse and Stanton. The film is a sequel and spinoff to 2003's Finding Nemo and features the reprised voices of Ellen DeGeneres and Albert Brooks, as well as the new voices of Hayden Rolence (replacing Alexander Gould), Ed O'Neill, Kaitlin Olson, Ty Burrell, Diane Keaton and Eugene Levy. Finding Dory focuses on the amnesiac fish Dory, who journeys to be reunited with her parents. Along the way, she is captured and taken to a California public aquarium, from which Marlin and Nemo attempt to rescue her. The film premiered at the El Capitan Theatre in Los Angeles on June 8, 2016, and was released in the United States on June 17, 2016. Upon release, the film was a critical and commercial success, grossing over $1 billion worldwide, becoming the second Pixar film to cross this mark following Toy Story 3 (2010). The film set numerous records, including the highest-grossing animated film opening of all time in North America. Dory, as a child, gets separated from her parents. As she grows up, Dory attempts to search for them, gradually forgetting them due to her short-term memory loss. After accidentally running in with Marlin, a clownfish, who's looking for his missing son, she goes to help him. One year after reuniting Nemo with Marlin, Dory has become a helping hand in raising Nemo. One day during a lesson with Nemo's class, Dory recalls through a childhood flashback that she has a family. She decides to look for them but finds her short-term memory loss to be an obstacle. The only thing she remembers is that they lived at the Jewel of Morro Bay. Marlin and Nemo accompany Dory in her quest. With the help of Crush, they ride a water current to California. Upon arrival, Dory accidentally awakens a predatory squid, who immediately pursues them, almost devouring Nemo during the chase. Marlin tends to his son afterwards and yells at Dory for almost getting him killed. Feeling hurt, Dory travels to the surface to seek help and is captured by staff members from the nearby Marine Life Institute after being caught in six pack rings. Dory is sent to the quarantine section and tagged. There she meets a grouchy but well-meaning, seven-legged octopus named Hank. Dory's tag shows that she will be sent to an aquarium in Cleveland. Due to a traumatic ocean life, Hank wants to live in the aquarium instead of being released back into the ocean, so he agrees to help Dory find her parents in exchange for her tag. In one exhibit, Dory encounters her childhood friend Destiny, a nearsighted whale shark who used to communicate with Dory through pipes, and Bailey, a beluga whale who believes he has lost his ability to echolocate. Dory subsequently has flashbacks of life with her parents and struggles to recall details, but finally remembers how she became separated from her parents: she overheard her mother crying one night, left home to retrieve a shell in hopes of cheering her up, and was pulled away by an undertow current. Subsequently, she learns that the rest of her regal blue tangs species are being moved to Cleveland. Marlin and Nemo attempt to rescue Dory. With the help of two sea lions named Fluke and Rudder and a disfigured common loon named Becky, they manage to get into the institute, and reunite with her in the pipe system. Back in Quarantine, they locate the tank of blue tangs who tell them that Dory's parents escaped the Institute a long time ago to search for Dory but never came back. This leaves Dory under the impression that they died. Hank retrieves Dory from the tank, accidentally leaving Marlin and Nemo behind. He is then apprehended by one of the employees and unintentionally drops Dory into the drain flushing her to the ocean. Whilst wandering aimlessly, she comes across a trail of shells; remembering that when she was young, her parents had set out a similar trail to teach her how to find her way back home, she follows it. At the end of the trail, Dory finds an empty home with multiple shell trails leading away from it. As she turns to leave, she sees her parents Jenny and Charlie in the distance and joyfully reunites with them. They tell her they have spent years forming trails for her to follow in the hopes that she would eventually find them. Marlin, Nemo, and Hank end up in the truck taking various aquatic life to Cleveland. Destiny and Bailey escape from their exhibit to help Dory rescue them. Once on board the truck, Dory persuades Hank to return to the sea with her, and together, they hijack the truck and drive it down a busy road before crashing it into the water, freeing all the fish. Dory, along with her parents and new friends, return to the reef with Marlin and Nemo. In the post-credits scene, the Tank Gang from the first film, still trapped inside their (now algae-covered) plastic bags, reach California one year after floating across the Pacific Ocean. They are promptly rescued by the staff members from before, with Bloat asking for the second time, "Now what?" Ellen DeGeneres as Dory, a regal blue tang who suffers from short-term memory loss. Sloane Murray as Baby Dory. Murray is the seven-year-old daughter of producer Lindsey Collins. Lucia Geddes as Tween Dory. Albert Brooks as Marlin, an overprotective ocellaris clownfish, Nemo's father and Dory's friend. Hayden Rolence as Nemo, a young optimistic clownfish and Marlin's son. He was voiced by Alexander Gould in the previous film. Ed O'Neill as Hank, a cranky East Pacific red octopus who previously lost a tentacle. Diane Keaton as Jenny, Dory's mother. Eugene Levy as Charlie, Dory's father. Kaitlin Olson as Destiny, a near-sighted whale shark and Dory's childhood friend. Ty Burrell as Bailey, a beluga whale who temporarily lost echolocation due to a concussion. Idris Elba as Fluke, a sea lion. Dominic West as Rudder, a sea lion and Fluke's friend. Bob Peterson as Mr. Ray, a spotted eagle ray and Nemo's schoolteacher. Andrew Stanton as Crush, a green sea turtle that lives on the East Australian Current, and the Seagulls. Bennett Dammann as Squirt, Crush's son. He was voiced by Nicholas Bird in the previous film. Bill Hader as Stan, a kelp bass. Kate McKinnon as Stan's wife. Sigourney Weaver as herself, the voice intercom announcer for the Institute PA system. Alexander Gould as Passenger Carl, a delivery truck driver that works for the Institute, and Passenger Tommy, Carl's co-worker. Gould voiced Nemo in the previous film. John Ratzenberger as Bill, a crab. Torbin Xan Bullock as Gerald, an outcast California sea lion who is frequently treated with hostility by Fluke and Rudder, and Becky, a friendly and helpful but dimwitted common loon. Katherine Ringgold as Kathy, a chickenfish. Angus MacLane as Charlie Back-and-Forth, a sunfish. Willem Dafoe as Gill, a Moorish idol, who is the leader of the "Tank Gang." Brad Garrett as Bloat, a pufferfish. Allison Janney as Peach, a pink starfish. Austin Pendleton as Gurgle, a royal gramma. Stephen Root as Bubbles, a yellow tang. Vicki Lewis as Deb/Flo, a four-striped damselfish. Jerome Ranft as Jacques, a cleaner shrimp. He was voiced by Joe Ranft, Jerome's late brother, in the previous film. 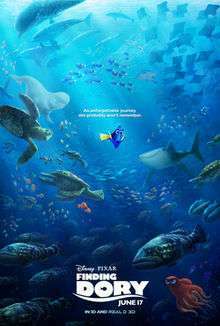 Prior to work on Finding Dory, Disney had planned to make a Finding Nemo sequel without Pixar's involvement, through Circle 7 Animation, a studio Disney announced in 2005 with the intention to make sequels to Pixar properties. However, in 2006, Circle 7 was shut down by Disney without ever having produced a film. In July 2012, it was reported that Andrew Stanton was developing a sequel to Finding Nemo, with Victoria Strouse writing the script and a release date scheduled for 2016. However, the same day the news of a potential sequel broke, Stanton posted a message on his personal Twitter calling into question the accuracy of these reports. The message said, "Didn't you all learn from Chicken Little? Everyone calm down. Don't believe everything you read. Nothing to see here now. #skyisnotfalling." According to a report by The Hollywood Reporter published in August 2012, Ellen DeGeneres was in negotiations to reprise her role of Dory. In September 2012, it was confirmed by Stanton, saying: "What was immediately on the list was writing a second Carter movie. When that went away, everything slid up. I know I'll be accused by more sarcastic people that it's a reaction to Carter not doing well, but only in its timing, but not in its conceit." In February 2013, it was confirmed by the press that Albert Brooks would reprise the role of Marlin in the sequel. I have waited for this day for a long, long, long, long, long, long time. I'm not mad it took this long. I know the people at Pixar were busy creating Toy Story 16. But the time they took was worth it. The script is fantastic. And it has everything I loved about the first one: It's got a lot of heart, it's really funny, and the best part is—it's got a lot more Dory. In a July 2013 interview with Los Angeles Times, Stanton spoke of the sequel's origin: "There was polite inquiry from Disney [about a Finding Nemo sequel]. I was always 'No sequels, no sequels.' But I had to get on board from a VP standpoint. [Sequels] are part of the necessity of our staying afloat, but we don't want to have to go there for those reasons. We want to go there creatively, so we said [to Disney], 'Can you give us the timeline about when we release them? Because we'd like to release something we actually want to make, and we might not come up with it the year you want it.'" In a 2016 interview Stanton stated how the film's story came to be; "I don't watch my films that often after they're done because I have to watch them so many times before they come out. So about 2010 when we were getting Finding Nemo ready for the 10-year re-release in 3D, it was interesting to watch again after all that time. Something kind of got lodged in the back of my brain and started to sort of stew. I started to think about how easily Dory could get lost and not find Marlin and Nemo again. She basically was in the same state that she was when Marlin found her. I didn't know where she was from. I knew that she had spent most of her youth wandering the ocean alone, and I wanted to know that she could find her new family, if she ever got lost again. It's almost like the parental side of me was worried." Stanton additionally stated: "I knew if I ever said Finding Dory or mentioned a sequel to Finding Nemo out loud, I’d be done, [T]here would be no way I'd be able to put that horse back in the barn. So I kept it very quiet until I knew I had a story that I thought would hold, and that was in early 2012. So I pitched it to John Lasseter and he was all into it. Then I got a writer, and once we had a treatment that we kind of liked, I felt comfortable calling Ellen." Stanton selected Victoria Strouse to write the screenplay. She later said, "It was always collaborative with Andrew, but really the screenwriting was me. Of course, Andrew would do passes, and he and I would brainstorm a lot together and then we would bring it to the group of story artists. People would weigh in and share ideas." She pointed to Dory's forgetfulness as a challenge when writing the script, adding, "You don't realize until you sit down to write a character who can't remember things how integral memory is to absolutely everything we do, and that's what creates a narrative that people can follow. When a main character can't self-reflect and can't tell a story, that character is very difficult to design because she can't really lead. To get her to be able to lead and to get an audience to be able to trust her was the hardest thing to do." The fictional Marine Life Institute depicted extensively in the film is based on the production team's research trips to the Monterey Bay Aquarium, the Marine Mammal Center and the Vancouver Aquarium. The film's ending was revised after Pixar executives viewed Blackfish, a 2013 documentary film which focuses on the dangers of keeping orca whales in captivity. Initially, some of the characters were to end up in a SeaWorld-like marine park, but the revision gave them an option to leave. On September 18, 2013, it was announced that the film would be pushed back to a June 17, 2016, release. Pixar's The Good Dinosaur was moved to the November 25, 2015, slot to allow more time for production of the film. In June 2014, it was revealed through Stanton's Twitter feed that the film would be co-directed by Angus MacLane. In August 2015, at Disney's D23 Expo, it was announced that Hayden Rolence would voice Nemo, replacing Alexander Gould from the first film, whose voice has deepened since reaching adulthood (Gould voiced a minor character in the sequel instead). In addition to Rolence, Ed O'Neill was revealed to be the voice of Hank. To make light more realistic, RenderMan was completely re-engineered, its biggest change in 25 years. The film's soundtrack entitled Finding Dory: Original Motion Picture Soundtrack was composed by Thomas Newman and released on June 17, 2016. Louis Armstrong's version of "What a Wonderful World" is played during the scene in which fish are released into the ocean as the truck Dory and Hank are driving crashes into the water. On May 20, 2016, Sia performed a cover of Nat King Cole's "Unforgettable" on The Ellen DeGeneres Show following an announcement that it would be featured in the film. Finding Dory premiered at the El Capitan Theatre in Los Angeles on June 8, 2016, and was theatrically released in the United States on June 17, 2016, in 2D, Disney Digital 3-D and RealD 3D. It was also released to select IMAX 3D theaters. In April 2016, it was announced that a new Pixar short, Piper, directed by Alan Barillaro and with music by Adrian Belew, would be shown in front of the film. It had its UK premiere at the Edinburgh International Film Festival on June 18, 2016. Finding Dory was released by Walt Disney Studios Home Entertainment on Blu-ray (2D and 3D) and DVD in the United States on November 15, 2016, with a digital release on October 25. The DVD release includes the short film, Piper. As of November 27, 2016, Finding Dory has grossed $486.3 million in the USA & Canada and $540.7 million in other countries, for a worldwide total of $1.027 billion against a budget of $200 million. It had a worldwide opening of $185.7 million, which is the second biggest of all time for an animated film behind Ice Age: Dawn of the Dinosaurs ($218.4 million), and an IMAX global opening of $6.4 million. On August 16, it became the fourth film of 2016 to earn $900 million in ticket sales, and on October 9—its 17th weekend—it passed the $1 billion threshold, becoming the third film of 2016 to reach that mark joining Captain America: Civil War and Zootopia, the second Pixar film (after Toy Story 3), the fifth animated film (after Toy Story 3, Frozen, Minions, and Zootopia), the twelfth Disney film (fourth Disney animated film) and the 27th film overall in cinematic history. The film was projected to make over $1.2 billion in global ticket sales because of its former film's critical success, although it failed to do so. Worldwide, it is the second highest-grossing film of 2016, the second highest-grossing Pixar film ever, the fourth highest-grossing animated film of all time, and the 23rd highest-grossing film of all time. In the United States and Canada, Finding Dory opened on June 17, 2016, alongside Central Intelligence, with projections having the film grossing $110–120 million in its opening weekend, with some estimates going as high as $130 million. It received the widest release for a Pixar film (4,305 theaters, breaking Brave's record), of which 3,200 venues were in 3D, along with 425 premium large format locales, approximately 100 IMAX theaters and a handful of Dolby Cinema sites. It was Fandango's top pre-selling animated film of all time, outselling the previous record-holder, Minions. The film grossed $9.2 million from Thursday night previews, a record for both Pixar and any animated film, and $54.7 million on its opening day, marking both the biggest opening day and single-day for an animated film. This also marks the first time that an animated film has grossed over $50 million in a single day. It went on to gross $135.1 million in its opening weekend, finishing first at the box office and setting the record for the highest opening weekend for both Pixar (breaking Toy Story 3's record) and any animated film (breaking Shrek the Third's record), and became the third biggest adjusted for inflation. It is also the second highest opening (excluding Marvel films and Star Wars: The Force Awakens) for Walt Disney Studios Motion Pictures behind Pirates of the Caribbean: Dead Man's Chest ($135.6 million) and is the studio's seventh biggest debut overall. It also became the fifth animated film and the fifth film of 2016 to open above $100 million. Morever, its opening also marked the second biggest for the month of June, behind only Jurassic World. Its opening was 93.8% above Finding Nemo's $70.3 million debut. It further broke the record for the biggest PLF and Cinemark XD opening for an animated film with $10.4 million and $2.6 million respectively. In IMAX, it made $5 million from 211 IMAX theaters, the third best animated IMAX opening behind Zootopia ($5.2 million) and Toy Story 3 ($8.4 million). Following its record breaking openings, it scored the biggest Monday for Pixar by grossing $19.6 million (breaking Toy Story 3's $15.6 million) and the best Monday in June for an animated film. However, among all animated films, it is ranked second — behind 2004's Shrek 2, which made $23.4 million on its first Monday, and it is also the biggest Tuesday for an animated film with $23.2 million, besting Minions' $16.8 million. It jumped 18.5% over its Monday gross, a rare achievement for a film. It crossed the $200 million mark in its first seven days, becoming the first (and fastest) animated film to pass the said milestone in just a week. It fell only 46% in its second weekend earning $73 million to record the biggest second weekend for an animated film (breaking Shrek 2's $72.2 million previous record), the biggest for Disney and 2016 (surpassing Captain America: Civil War's $72.6 million), and the eighth biggest second weekend gross of all time overall. This was despite facing stiff competition from newcomer Independence Day: Resurgence. It crossed $300 million in twelve days — a new record for an animated film, surpassing the previous record held by Shrek 2 and Toy Story 3 (both of which took 18 days), and became the second animated film of 2016 (after Zootopia), the fourth Disney film of 2016, and the sixth overall film of the year to cross the milestone. It continued to dominate the box office for the third straight weekend, despite competitions from three new wide releases—The Legend of Tarzan, The Purge: Election Year, and The BFG—after witnessing a 42% decline to $41.8 million in three days and $51.4 million in four days, respectively, during the Independence Day holiday frame. This made it the second time in two years and just the third time since 1992, the July 4th holiday box office was topped by a film in its third weekend of release. It broke another record as it passed the $400 million mark in 21 days, which is the fastest for an animated film, the fastest of 2016, the fastest for the studio and the fifth fastest of all time overall. Morever, it became the second film of 2016 (after Captain America: Civil War), the fifth animated film, the ninth film for the studio, and the 24th film overall to pass the milestone. On the following day (July 8), it surpassed Civil War to become the biggest film of the year. It dropped out of the top ten in its eighth week. Although the film was finally overtaken by The Secret Life of Pets (and The Legend of Tarzan in second place) in its fourth weekend, it nevertheless passed The Lion King to become the highest-grossing Disney animated film of all time in the same weekend, surpassing the latter which held the record for 15 non-consecutive years. In just 30 days, it overtook Shrek 2 ($441.2 million) to become the highest-grossing animated film of all time, breaking the latter's twelve-year-old record. Four days later, on July 20, it became the first ever animated film in cinematic history to cross the $450 million mark. As with its predecessor Finding Nemo, the studio expanded the theater count for the film during the Labor Day weekend from 345 theaters to 2,075 theaters, an addition of 1,730 theaters. In 2003, Nemo was expanded from 838 sites to 1,053 locations. It is currently the highest-grossing film of 2016, the highest-grossing Pixar film, the highest-grossing Walt Disney Pictures release, the highest-grossing Disney animated film, the highest-grossing animated film overall, and the seventh highest-grossing film of all time. Internationally, Finding Dory received a staggered release in a span of four months from June to September, with Germany being the last country. This was done in order take advantage of key holidays and competitive dates around the world. It was released across 29 countries—which is 32% of its entire international release territories—the same weekend as its U.S. premiere. It made an estimated $50.7 million to take the No. 1 spot at the international box office. In its second weekend, it added $38.7 million from 37 markets, falling in third place behind Independence Day: Resurgence and Now You See Me 2. In the same weekend along with its $73 million take in North America, the film helped Pixar cross the $10 billion mark worldwide since Toy Story (1995). By its fourth weekend, the animated film helped Disney push past the $3 billion mark internationally and $5 billion globally. It had the biggest opening for an animated film in Brazil ($7.1 million) and the Netherlands ($2.1 million), and the biggest of all time for a Disney animated or Pixar film in Australia ($7.7 million), the Philippines ($2.1 million), Singapore ($1.3 million), India ($1 million), Indonesia, Peru and Central America, and in Russia it opened with $3.19 million, and the second biggest in the United Kingdom and Ireland ($10.7 million), Mexico ($9.4 million) and Argentina ($3.5 million), and that's despite amidst the latter country's Copa America soccer match, and Colombia ($2.1 million), behind Monsters University. In the UK and Ireland, the film recorded the second biggest animated opening of the year with £8.1 million ($10.7 million) from 580 theaters, behind only The Secret Life of Pets. However, if previews are excluded, Finding Dory is ahead. Moreover, it also posted the second biggest Disney/Pixar opening, behind only Toy Story 3 (fourth biggest if previews are included), and the seventh biggest animated opening of all time overall based on pure Friday-to-Sunday gross alone. It added an additional 43 theaters in its second weekend, after which it added another £3.98 million ($5.1 million) at the weekend, thereby passing the £20 million mark in just ten days (among Pixar films, only Toy Story 3 reached £20 million faster). It made an impressive £8.15 million during weekdays, from Monday to Thursday resulting in a £2.03 million daily average gross. According to The Guardian, this was because of the school holidays that prevailed on the weekdays. Otherwise, family films earn the vast majority of their takings on Saturday and Sunday, and showtimes typically reduce on weekdays. It returned to the top of the box office in its fourth weekend and went on to become the highest-grossing film of the summer this year. In Brazil, in addition to recording the biggest Disney/Pixar opening ever, almost twice the previous record held by The Good Dinosaur, it also set a new record for an all-time animated opening, on par with Minions in local currency. In South Korea, it had the biggest opening for a Pixar film with $7.1 million, which is also the second biggest for a Disney animated film, behind Frozen. In Japan, the film had a two-day weekend opening of $7 million on Saturday and Sunday from 511 screens on 571,000 admissions. For the entire three-day holiday weekend, including Marine Day on Monday July 18, the film earned $11 million on 922,000 admissions. This made it the top western release of the weekend and the biggest foreign opening weekend in the country so far of this year. It had further number one openings in Spain ($4.9 million), France ($4.7 million), Hong Kong ($1.9 million; $2.8 million including previews), Taiwan ($1.9 million), Sweden, Norway and Denmark. It topped the box office in the Netherlands for three and in Spain and Australia for four consecutive weekends. In Italy, it scored the biggest animated opening of the year with $5.8 million. In China, where Pixar films have been struggling to find broad audiences and accrue lucrative revenues, the film was projected to make around $30 million in its opening weekend. The film ended up grossing $17.7 million—the highest Pixar opening in the country's history—debuting in second place behind Warcraft. It surpassed Monsters University in just seven days to become the biggest Pixar film there with $38.1 million. It opened in Germany—its last market—on September 30, where the film delivered a robust opening of $8.4 million, the biggest for any film of 2016 in the country. The film continued to benefit from German Unity Day on October 3. It went on to top the box office there for three straight weekends and even tying with Inferno in its third weekend. It is now the highest-grossing Disney animated or Pixar film in Australia (where it is also the second highest-grossing animated film of all time behind Shrek 2), Bolivia, Brazil, Central America, Colombia, India, Indonesia, New Zealand, Peru, the Philippines, and Trinidad. It also became the second highest-grossing Pixar release of all time in South Korea behind Inside Out. Elsewhere, the biggest markets in terms of total earnings are Japan ($65.9 million), followed by the UK ($55 million), China ($38.4 million), and Australia ($36.2 million) and Brazil ($34.5 million). Finding Dory received positive reviews from critics. On review aggregator website Rotten Tomatoes, the film has an approval rating of 94% based on 250 reviews and an average rating of 7.7/10. The site's critical consensus reads, "Funny, poignant, and thought-provoking, Finding Dory delivers a beautifully animated adventure that adds another entertaining chapter to its predecessor's classic story." On Metacritic, the film has a score of 77 out of 100 based on 48 reviews, indicating "generally favorable reviews." Audiences polled by CinemaScore gave the film an average grade of "A" on an A+ to F scale. Mike Ryan of Uproxx gave the film a positive review, saying: "I never thought I wanted a sequel to Finding Nemo, but here we are and I'm pretty happy it exists. And, for me, it was a more emotional experience than the first film. Finding Dory got me – it made me cry." A.O. Scott of The New York Times said that while the film lacks "dazzling originality," he overall wrote, "it more than makes up for in warmth, charm and good humor." In his review for Variety, Owen Gleiberman wrote, "It's a film that spills over with laughs (most of them good, a few of them shticky) and tears (all of them earned), supporting characters who are meant to slay us (and mostly do) with their irascible sharp tongues, and dizzyingly extended flights of physical comedy." The Wall Street Journal's Joe Morgenstern said, "Finding Dory can be touching, sweet and tender, but it's compulsively, preposterously and steadfastly funny." Peter Travers of Rolling Stone gave the film three-and-a-half stars out of four and said that the film "brims with humor, heart and animation miracles," despite lacking "the fresh surprise of its predecessor." Conservationists warned that very much like Finding Nemo, the film could lead to uninformed customers buying blue tang for home aquariums. Blue tang cannot be bred in captivity and have to be caught in the wild. They are related to surgeonfish and exhibit razor-sharp spines on both sides of the tail that can inflict formidable wounds. While promoting the film, actress Ellen DeGeneres reminded audiences that Nemo’s and Dory’s real life home, the Great Barrier Reef, is under enormous threat mostly due to coral bleaching, a process induced by climate change, which has killed coral reefs on an enormous scale. In June 2016, director Andrew Stanton talked about the possibility of a sequel, saying that he would never exclude it because of the introduction of new characters, citing the Toy Story films as exemplifying factors in how to expand a world through sequels. ↑ "D23: 'Finding Dory' Cast Adds Ed O'Neill, Ty Burrell and Kaitlin Olson". Variety. August 14, 2015. Retrieved August 15, 2015. ↑ "Finding Dory". Metacritic. Retrieved July 6, 2016. ↑ Grover, Ronald. "Disney Banks on 'Finding Dory' Swimming Past Soggy Openings of Recent Movie Sequels". TheStreet.com. Retrieved June 15, 2016. 1 2 "Finding Dory (2016)". Box Office Mojo. Amazon.com. Retrieved November 28, 2016. 1 2 Kit, Borys (July 7, 2012). "Andrew Stanton to Direct Pixar's 'Finding Nemo' Sequel". The Hollywood Reporter. Retrieved April 2, 2013. 1 2 Farley, Christopher John (April 2, 2013). "Ellen DeGeneres to Star in 'Nemo' Sequel 'Finding Dory'". The Wall Street Journal. Retrieved April 2, 2013. ↑ Isaac Feldberg (June 11, 2014). "Angus MacLane Co-Directing Finding Dory With Andrew Stanton". We Got This Covered. Retrieved July 10, 2014. ↑ Josh Terry (June 17, 2016). "Disney/Pixar Team dives into surprising new depths in 'Nemo' sequel 'Finding Dory' (+Points for parents)". Deseret News. Retrieved September 14, 2016. ↑ Risley, Matt (April 2, 2013). "Pixar confirm Finding Nemo sequel". Total Film. Retrieved April 2, 2013. ↑ Zeitchik, Steven (April 2, 2013). "Ellen DeGeneres' 'Nemo' sequel, 'Finding Dory,' set for 2015". Los Angeles Times. Retrieved April 2, 2013. ↑ Keegan, Rebecca (September 18, 2013). "'The Good Dinosaur' moved to 2015, leaving Pixar with no 2014 film". The Los Angeles Times. Retrieved September 18, 2013. ↑ Alexander, Bryan (June 21, 2016). "Baby Dory is just one of the secret stars of 'Finding Dory'". USA Today. Retrieved June 25, 2016. ↑ Armstrong, Josh (March 5, 2012). "Bob Hilgenberg and Rob Muir on the Rise and Fall of Disney's Circle 7 Animation". Retrieved March 27, 2012. ↑ Hill, Jim (August 7, 2005). "The Skinny on Circle Seven". Retrieved March 27, 2012. ↑ Fischer, Russ. "Behind The Scenes at Circle 7, the Short-Lived Studio Created to Sequelize Pixar". /Film. Retrieved March 18, 2016. ↑ "'John Carter' Helmer Andrew Stanton Dives Back Into Animation With 'Finding Nemo' Sequel". Deadline.com. Retrieved July 18, 2012. ↑ Kit, Borys (July 17, 2012). "Andrew Stanton to Direct Pixar's 'Finding Nemo' Sequel". The Hollywood Reporter. Retrieved July 17, 2012. ↑ Stanton, Andrew. "@andrewstanton". Twitter. Retrieved August 23, 2012. ↑ Rose, Lacey (August 21, 2012). "Ellen DeGeneres in Talks to Return for 'Finding Nemo' Sequel (Exclusive)". The Hollywood Reporter. Retrieved August 22, 2012. ↑ Keegan, Rebecca (September 8, 2012). "Director Andrew Stanton looks back on 'John Carter's' rocky path". Los Angeles Times. Retrieved September 8, 2012. ↑ Fleming Jr., Mike (February 12, 2013). "Albert Brooks Hooks Deal To Reprise In 'Finding Nemo 2′". Deadline.com. Retrieved February 12, 2013. 1 2 Zakarin, Jordan (April 2, 2013). "Pixar's 'Finding Nemo' Sequel Titled 'Finding Dory,' Set for 2015". The Hollywood Reporter. Retrieved January 12, 2014. ↑ Keegan, Rebecca (July 5, 2013). "With 'Despicable Me 2' and more, movies revisit the sequel debate". Los Angeles Times. Retrieved August 7, 2013. ↑ Draskovic, Marina (June 17, 2016). "Director Andrew Stanton Brings Dory Back". D23.com. Retrieved June 17, 2016. 1 2 McKittrick, Christopher (June 22, 2016). "Writing in Slow Motion: Finding Dory". Creative Screenwriting. Retrieved June 26, 2016. ↑ Eagan, Daniel (13 June 2016). "Ocean Odyssey: Andrew Stanton explores the backstory of Pixar's Dory". Film Journal International. Mediabistro Holdings. Retrieved 26 September 2016. ↑ Kaufman, Amy (August 9, 2013). "'Blackfish' gives Pixar second thoughts on 'Finding Dory' plot". The Los Angeles Times. Retrieved August 9, 2013. ↑ Barnes, Brooks (August 9, 2013). "'Finding Nemo' Sequel Is Altered in Response to Orcas Documentary". The New York Times. Retrieved August 10, 2013. ↑ "Pixar Skips 2014 as 'The Good Dinosaur' Shifts to 2015 and 'Finding Dory' to 2016 | /Film". Slashfilm.com. September 18, 2013. Retrieved October 24, 2013. ↑ Angie Han (June 11, 2014). "Pixar Updates: 'Finding Dory' Gets Co-Director, More 'Inside Out' Details Revealed". /Film. Retrieved July 10, 2014. 1 2 G. Macy, Seth (August 14, 2015). "D23 2015: New Details on Finding Nemo Sequel Plot Revealed". Retrieved August 15, 2015. ↑ "Finding Nemo star loses his character's voice". BBC News. March 27, 2013. Retrieved March 27, 2013. ↑ Barcomb, James (June 6, 2014). "Thomas Newman to score Finding Dory". The Whale. Retrieved June 6, 2014. ↑ "'Finding Dory' Soundtrack Details". Film Music Reporter. Retrieved May 30, 2016. 1 2 El-ahrairah (2016-06-26). "Finding Dory Forgettable — A Review". Modern Topics. Retrieved 2016-07-17. ↑ Lang, Brent (April 6, 2015). "'Captain America: Civil War,' 'Star Wars: Rogue One' Secure Imax Release as Part of Disney Deal". Variety. Retrieved February 23, 2016. ↑ Giardina, Carolyn (April 7, 2016). "Pixar's New Short, 'Piper,' Has a Painterly Look and Adrian Belew Score". Hollywood Reporter. Retrieved April 8, 2016. ↑ "Programme". Edinburgh International Film Festival. Retrieved June 19, 2016. ↑ "'Finding Dory' to Have U.K. Premiere at Edinburgh Film Festival". The Hollywood Reporter. Retrieved June 19, 2016. ↑ Wolfe, Jennifer (September 8, 2016). "Pixar's 'Finding Dory' Swims to Blu-ray November 15". Animation World Network. Retrieved September 10, 2016. 1 2 Scott Mendelson (June 19, 2016). "Box Office: 'Finding Dory' Swims To Record $136 Million Weekend". Forbes. Retrieved June 20, 2016. ↑ "Worldwide Openings". Box Office Mojo. Retrieved June 23, 2016. 1 2 3 4 5 6 Nancy Tartaglione (June 19, 2016). "'Finding Dory' Splashes Out With $50.7M Offshore Opening; 'Warcraft' Crosses $200M In China – Intl Box Office Final". Deadline.com. Retrieved June 23, 2016. ↑ Anthony D'Alessandro (August 16, 2016). "'Finding Dory' Clears $900M At The Worldwide Box Office". Deadline. Retrieved August 16, 2016. ↑ Pamela McClintock (October 9, 2016). "Box-Office Milestone: 'Finding Dory' Crosses $1B Worldwide". The Hollywood Reporter. Retrieved October 10, 2016. 1 2 Nancy Tartaglione (October 9, 2016). "'Finding Dory' Splashes Past $1 Billion At Worldwide Box Office". Deadline.com. Retrieved October 9, 2016. ↑ "2016 WORLDWIDE GROSSES". Box Office Mojo. Retrieved September 25, 2016. 1 2 "Pixar". Box Office Mojo. Retrieved September 4, 2016. ↑ Brent Lang (June 6, 2016). "'Finding Dory' Could Be Pixar's Biggest Opening". Variety. Retrieved June 7, 2016. ↑ Lang, Brent (July 7, 2016). "Box Office: 'Conjuring 2' to Ward Off 'Warcraft,' 'Now You See Me 2'". Variety. 1 2 Anthony D'Alessandro (June 14, 2016). "'Finding Dory' To Have Shark-Size Appetite At Weekend B.O. ; Second Best Opening This Summer After 'Civil War' – Preview". Deadline.com. Retrieved June 15, 2016. ↑ Pamela McClintock (June 15, 2016). "Box-Office Preview: 'Finding Dory' Set to Swim Past $100M in U.S. Bow". The Hollywood Reporter. Retrieved June 15, 2016. ↑ Boxoffice Staff (June 3, 2016). "Long Range Forecast: 'Jason Bourne', 'Bad Moms' & 'Nerve'". BoxOffice Pro. Retrieved June 6, 2016. ↑ Dave McNary (June 17, 2016). "'Finding Dory' Set to Break Record for Biggest Animated Film Opening With $130 Million". Variety. Retrieved June 18, 2016. ↑ BoxOfficeStaff (June 16, 2016). "Fandango: 'Finding Dory' Surpasses 'Minions' As Top Pre-Selling Animated Film of All Time". BoxOffice. Retrieved June 17, 2016. ↑ Rebecca Ford (June 17, 2016). "Box Office: 'Finding Dory' Lands Strong $9.2 Million Thursday". The Hollywood Reporter. Retrieved June 17, 2016. ↑ Scott Mendelson (June 17, 2016). "'Finding Dory' Box Office: A Record $9.2M Thursday For The Pixar Sequel". Forbes. Retrieved June 17, 2016. ↑ Scott Mendelson (June 18, 2016). "Pixar's 'Finding Dory' Finds Record-Crushing $55 Million Friday (Box Office)". Forbes. Retrieved June 18, 2016. ↑ Brad Brevet (June 16, 2016). "'Finding Dory' Set to Break the Animated Opening Weekend Record". Box Office Mojo. Retrieved June 19, 2016. ↑ ""Finding Dory" breaks record for opening of animated film". Associated Press. June 20, 2016. Retrieved June 20, 2016. ↑ "Buena Vista All-time Openings". Box Office Mojo. June 20, 2016. Retrieved June 20, 2016. ↑ Anthony D'Alessandro (June 20, 2016). "'Dory's Record Animated Pic $135M+ Opening Is Also Second Best For June After 'Jurassic World'". Deadline.com. Retrieved June 21, 2016. ↑ "Top Opening Weekends by Month—June". Box Office Mojo. Retrieved June 20, 2016. ↑ Brad Brevet (June 19, 2016). "'Finding Dory' Drowns Animated Box Office Records With $136 Million Opening". Box Office Mojo. Retrieved June 20, 2016. ↑ Brevet, Brad (March 6, 2016). "'Zootopia' Scores Disney Animation's Largest Opening Ever". Box Office Mojo. Retrieved March 7, 2016. ↑ Anthony D'Alessandro (June 21, 2016). "'Dory' Continues To Break B.O. Records For An Animated Film On Monday". Deadline.com. Retrieved June 22, 2016. ↑ Scott Mendelson (June 21, 2016). "Box Office: 'Finding Dory' Nabs Eye-Popping $19.5M Monday For $154M Cume". Forbes. Retrieved June 22, 2016. ↑ Anthony D'Alessandro (June 22, 2016). "'Dory' Darting To $200M, Hits Tuesday Record For Animated Film – Box Office". Box Office Mojo. Retrieved June 23, 2016. ↑ Scott Mendelson (June 22, 2016). "Box Office: 'Finding Dory' Earns Jaw-Dropping $23.7M Tuesday For New $177.8M Total". Forbes. Retrieved June 23, 2016. ↑ Scott Mendelson (June 24, 2016). "Box Office: Disney's 'Finding Dory' Ends Massive First Week With $213 Million". Forbes. Retrieved June 24, 2016. ↑ Anthony D'Alessandro (June 26, 2016). "'Dory' Posts Best Second Weekend For Animated Movie As Fireworks Die For 'Resurgence'; 'Shallows' Chomps $16M+". Deadline.com. Retrieved June 26, 2016. ↑ "TOP WEEKENDS: 2ND – 12TH". Box Office Mojo. Retrieved June 26, 2016. ↑ Pamela McClintock (June 26, 2016). "Box Office: 'Independence Day 2' Underwhelms With $41.6M; 'Finding Dory' Sprints to $73.2M". The Hollywood Reporter. Retrieved June 26, 2016. ↑ Anthony D'Alessandro (June 29, 2016). "'Dory' Eats $300M+ & Will Gobble Up 'BFG', 'Tarzan' & 'Purge' Over Independence Day – Box Office Preview". Deadline.com. Retrieved June 29, 2016. ↑ Scott Mendelson (June 29, 2016). "Box Office: Disney's 'Finding Dory' Swims To $300 Million In Record Time". Forbes. Retrieved June 30, 2016. ↑ Anthony D'Alessandro (July 3, 2016). "'Dory' Dominates, 'Tarzan' Improves, 'Purge' Excels As 'BFG' Falls: July 4th Weekend B.O. – Sunday Update". Deadline.com. Retrieved July 3, 2016. ↑ Scott Mendelson (July 3, 2016). "Box Office: 'Independence Day' Fails To Make July 4th Fireworks, 'Finding Dory' Tops Weekend". Forbes. Retrieved July 3, 2016. ↑ Scott Mendelson (July 7, 2016). "Box Office: Pixar's 'Finding Dory' Swims Past $400M In Record Time". Forbes. Retrieved July 8, 2016. ↑ "FASTEST TO $100–$500 Million". Box Office Mojo. Retrieved July 8, 2016. ↑ July 9, 2016. "Box Office: 'Finding Dory' Passes 'Captain America 3' To Become Top U.S. Hit Of 2016". Retrieved July 10, 2016. ↑ "Finding Dory moves out of top ten". Box Office Mojo. Retrieved August 4, 2016. ↑ Anthony D'Alessandro (July 10, 2016). "Toons Rule: 'Pets' Races To $103M+; 'Dory' Beats 'Lion King' Becoming Disney's Highest Grossing Animated Title At Domestic B.O.". Deadline.com. Retrieved July 10, 2016. ↑ Brent Lang (July 17, 2016). "Box Office: 'Ghostbusters' Debuts to $46 Million, 'Secret Life of Pets' Tops Charts". Variety. Retrieved July 17, 2016. ↑ Devan Coggan (July 18, 2016). "Finding Dory is now the biggest domestic animated movie ever". Entertainment Weekly. Retrieved July 18, 2016. ↑ "FASTEST TO $100–$500 Million". Box Office Mojo. Retrieved July 22, 2016. ↑ Anthony D'Alessandro (August 31, 2016). "'Dory' Makes A Wide Break Before Summer Ends". Deadline.com. Retrieved September 1, 2016. ↑ Brad Brevet (September 1, 2016). "'Don't Breathe' To Lead Labor Day Weekend Over 'Morgan' & 'Light Between Oceans'". Box Office Mojo. Retrieved September 3, 2016. ↑ "2016 DOMESTIC GROSSES". Box Office Mojo. Retrieved August 12, 2016. ↑ "Animation". Box Office Mojo. Retrieved July 17, 2016. ↑ "Domestic Grosses". Box Office Mojo. Retrieved August 10, 2016. 1 2 3 4 Nancy Tartaglione (June 27, 2016). "'Independence Day Resurgence' Lands With $100M Overseas Start; 'Dory' Nears $400M WW – Intl Box Office Final". Deadline.com. Retrieved June 28, 2016. 1 2 3 4 5 Nancy Tartaglione (July 3, 2016). "'Tarzan' Takes $18.8M In First Offshore Swing; 'TMNT2' Kicks Up $26M China Bow; 'Pets' Purrs – International Box Office". Deadline.com. Retrieved July 3, 2016. 1 2 3 4 5 6 Nancy Tartaglione (July 12, 2016). "'Ice Age' Leads Studio Pics; Chinese Summer & 'Sultan' Kick Off – Intl B.O. Final". Deadline.com. Retrieved July 12, 2016. ↑ Nancy Tartaglione (July 10, 2016). "Disney Hits $5B Global, $3B International Box Office In Record Time". Deadline.com. Retrieved July 11, 2016. 1 2 3 4 5 Nancy Tartaglione (July 17, 2016). "'Ice Age' Charts $53.5M Course To Lead Frame; 'Ghostbusters' Calls Up $19.1M In Offshore Bow – International Box Office". Deadline.com. Retrieved July 18, 2016. 1 2 Nancy Tartaglione (July 31, 2016). "'Jason Bourne' Supreme With $50.1M Bow & Franchise Records – Intl Box Office Update". Deadline.com. Retrieved August 1, 2016. ↑ Ian Sandwell (August 1, 2016). "'Finding Dory' swims to top of UK box office". Screen International. Retrieved August 2, 2016. ↑ Charles Gant (August 2, 2016). "Finding Dory surfaces atop UK box office as Jason Bourne spies second". The Guardian. Retrieved August 3, 2016. ↑ Charles Gant (August 9, 2016). "Crime pays: DC's Suicide Squad tops UK box office with £11.25m". The Guardian. Retrieved August 9, 2016. ↑ Charles Gant (August 23, 2016). "Cringe benefits: David Brent has highest new entry at UK box office". The Guardian. Retrieved August 23, 2016. ↑ Charles Gant (September 6, 2016). "Brotherhood the daddy at UK box office as Finding Dory crowned king of the summer". The Guardian. Retrieved September 7, 2016. ↑ Mark Schilling (July 19, 2016). "Japan Box Office: 'Finding Dory' Swims to the Top in Holiday Weekend". Variety. Retrieved August 3, 2016. ↑ Jonathan Papish (June 17, 2016). "On Screen China: Despite Upstream Struggle, Pixar's 'Dory' Could Haul It In". China Film Insider. Retrieved June 17, 2016. ↑ Nancy Tartaglione (October 2, 2016). "'Miss Peregrine' Books $36.5M; 'Finding Dory', 'Bridget Jones' Reach Milestones; Big Frame For Local Pics – Intl Box Office". Deadline.com. Retrieved October 3, 2016. ↑ Nancy Tartaglione (October 16, 2016). "'Inferno' Ignites With $50M Offshore; 'Miss Peregrine' Tops $130M – Intl Box Office". Deadline.com. Retrieved October 17, 2016. ↑ Anita Busch (July 25, 2016). "'Star Trek Beyond' $30M Debut; 'Lights Out' $8.5M; Jackie Chan's 'Skiptrace' Nails $64M Bow – Int'l Box Office Final". Deadline.com. Retrieved July 26, 2016. ↑ Lee Hyo-won (July 26, 2016). "South Korea Box Office: Local Zombie Film Breaks Records, Tops Hollywood Releases". The Hollywood Reporter. Retrieved July 26, 2016. ↑ "Finding Dory (2016)". Rotten Tomatoes. Retrieved September 15, 2016. ↑ "Finding Dory reviews". Metacritic. Retrieved June 23, 2016. ↑ Ryan, Mike (June 15, 2016). "'Finding Dory' Is Just About As Good As 'Finding Nemo' And Will Probably Make You Cry". Uproxx. Retrieved June 15, 2016. ↑ Scott, A.O. (June 15, 2016). "Review: In 'Finding Dory,' a Forgetful Fish and a Warm Celebration of Differences". The New York Times. Retrieved June 30, 2016. ↑ Gleiberman, Owen (June 10, 2016). "Film Review: 'Finding Dory'". Variety. Retrieved June 30, 2016. ↑ Morgenstern, Joe (June 16, 2016). "'Finding Dory' Review: Winning by Losing Once Again". The Wall Street Journal. Retrieved June 30, 2016. ↑ Travers, Peter (June 14, 2016). "'Finding Dory' Review". Rolling Stone. Retrieved June 30, 2016. ↑ Foster, Elizabeth (October 19, 2016). "Horrible Histories, TrueTube lead BAFTA Children's noms". Kidscreen. Retrieved October 23, 2016. ↑ "2016 Children's BAFTA Kids' Vote - Film". British Academy of Film and Television Arts. November 21, 2016. Retrieved December 2, 2016. ↑ "La La Land Leads with 12 Nominations for the 22nd Annual Critics' Choice Awards". Critics' Choice. December 1, 2016. Retrieved December 1, 2016. ↑ "Justin Timberlake & Alexandre Desplat Among Winners At Hollywood Music In Media Awards". Deadline. November 18, 2016. Retrieved November 18, 2016. ↑ McNary, Dave (November 2, 2016). "'La La Land' Scores Three Hollywood Music in Media Nominations". Variety. Retrieved November 3, 2016. ↑ "The 2016 WAFCA Awards Nominations". December 3, 2016. Retrieved December 4, 2016. ↑ "44th Annie Award Nominees". International Animated Film Society. November 28, 2016. Retrieved November 29, 2016. ↑ "People's Choice Awards 2017: Complete List of Nominations". E! Online. Retrieved November 15, 2016. ↑ Kilday, Gregg (November 29, 2016). "Satellite Awards Nominees Revealed". The Hollywood Reporter. Retrieved November 29, 2016. ↑ Snetiker, Marc (June 20, 2016). "'Finding Nemo 3'? Here's whether it could happen" (Entertainment Weekly). Entertainment Weekly. Retrieved 27 July 2016.